Kristina Schneider-Irudayam is passionate about both IT consulting and female entrepreneurship. Over the past 25 years she has developed her skills in a number of areas, including logistics, business process analysis, and project management. In November 2014, Kristina assumed the role of senior application manager for the major telecommunications company, Swisscom. She now works exclusively with in-house clients regarding logistics, IT consulting and business process improvement. She is also trusted to oversee a team of nine employees. 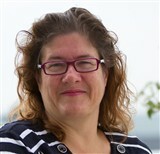 In addition to her work with Swisscom, Kristina owns and operates Business Women Bodensee (BWB). She manages all aspects of the company, which provides networking, workshops and resources for women in entrepreneurial positions. Kristina is committed to providing support for women who are already running their own businesses, as well as those who are thinking of starting a new business. In addition to juggling her work with both companies, Kristina enjoys spending time with her family, and traveling.